And now we’re coming down to the last four. Not only have I already seen all four of these films, but I’ve seen all the Best Picture nominees in these final four years. Now I’ve already reviewed Argo, 12 Years A Slave, and Birdman. I’ll probably do some quick little snapshots of those movies a little later on. 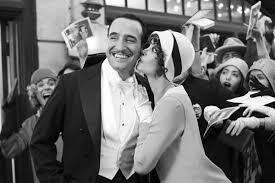 The Artist is basically one giant love letter to classic cinema from the 20s and 30s. If you’re a film lover, this is a movie you have to see. It’s clear that director Michel Hazanavicius loves this era of filmmaking, and wanted to do it justice. And I would say he definitely succeeded. We get some truly wonderful performances by Jean Dujardin and Berenice Bejo. It would have been really easy for the two actors to completely overplay their roles, but they brought just the right amount of subtlety to make it work. The film also has some costumes, sets, and music that are not only well done, but fit the film’s time period to a tee. The film also has excellent writing. The thing about making a silent movie is that you don’t need to use title cards for absolutely everything. You can still use the classic cinematic rule of ‘show, don’t tell’ by not only having great visuals, but having moments where title cards are absent but we can guess what the characters are saying based on the context. If you took away the film’s silent movie gimmick, it would still be a very good film. The story is strong enough to carry the movie on its own. But when you add the silent gimmick to the mix, it makes a very good film into a great one. Quite simply, they do not make movies like this anymore.